So to get myself back on track, I decided to make a really healthy salad. And this Beet Salad has got to be one of the healthiest salads on the planet. Beets, Cabbage, Carrots, four kinds of Seeds and a bunch of Spinach. Plus Orange Juice. Oh man! The colors in this salad are spectacular with the red cabbage and red onions, orange carrots, beets the color of red wine and the greens of the spinach and mint. Beautiful. This is how the salad looks when you are actually eating it. The dressing turns a brilliant red from the beets. There is something that happens when you taste the orange zest, cumin seeds and currents together. Some kind of magic on your taste buds. You’ll have to try it and see what I mean. And this is what my leftover salad looks like in its plastic container, ready to go in the frig. I love leftovers, as you know. I saved the dressing separately so tomorrow when I get home from work everything will be ready to mix up. No cutting or chopping! No measuring or whisking! I can hardly wait! P.s. My Fourth of July guests ate the Blueberry Cake. My husband liked the Checkerboard Cookies a lot, so they’re gone. The Peanut Butter Cookies are in the freezer. Now, about the Plum Tart, um, it’s in the frig and is being slowly reduced by one 1-inch-wide piece per day. Truly. I’m being good, I promise. Note: To cook beets, trim both ends and rub with olive oil. Roast in 400 degree F oven for one hour. When cool enough to handle, slip off the skins with a paper towel. Chill. 1. In a medium pan over medium heat, toast all the seeds together until slightly brown, 3-5 minutes. Stir frequently. You will know they are done when the pumpkin seeds start popping. 2. 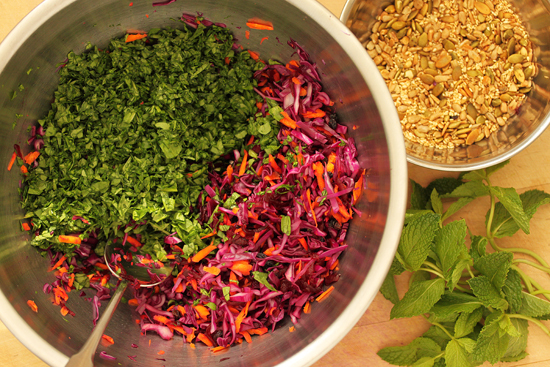 Make the dressing: In a small bowl, whisk together the Dressing ingredients. Set aside. 3. 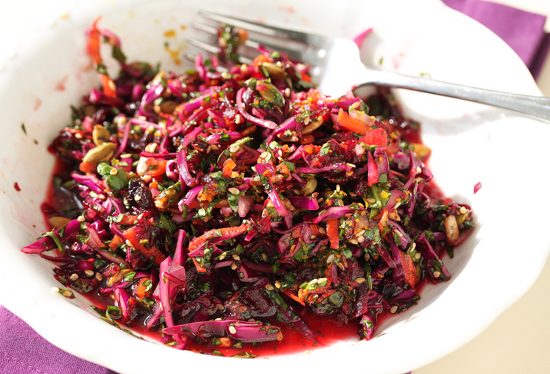 In a large bowl, combine the toasted seeds, cabbage, carrot, beet, spinach, red onion, currants and mint. 4. Pour the dressing over the salad and toss to combine. Serve. 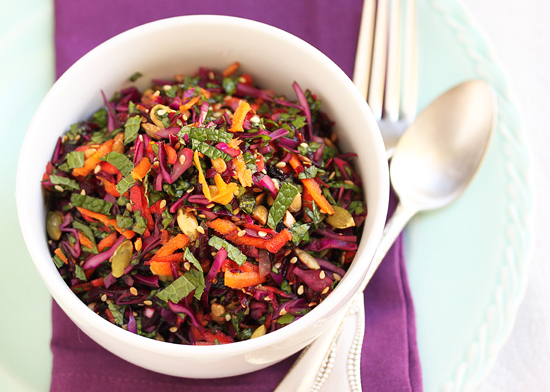 Anything with cabbage has to be on my list… and no cooking so I am def making it this week… Love the colors too. Wow, I love how colorful this is! The citrus sounds delicious with the cabbage and beet and the other veggies. Yum! This salad is so me, why have you been withholding it? Wow! 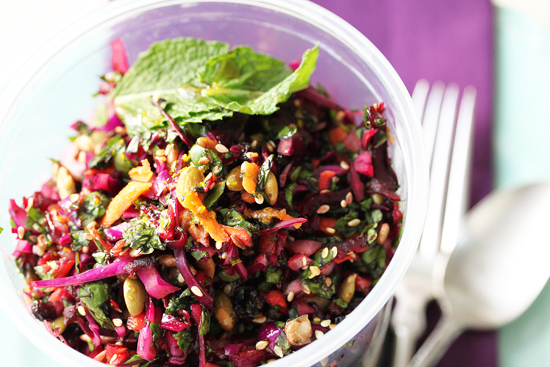 My fave ingredients all in one recipe—beets, red cabbage, cumin seeds, etc., etc. I even have a bottle of pomegranate molasses I’ve never used! Hot damn, girl! That salad is absolutely gorgeous! Mmm, colors. It also sounds amazing. I think we’re finally past beet season here, but I’m hanging on to this recipe for later! I was just browsing Foodgawker to find ways to use some of my CSA veggies, and this looks perfect! We have beets, carrots, red cabbage, and red onion to use, and we have mint in our garden. I’m so excited! So glad to find your blog! Love your recipes and photos. It sounds like you are now settled in your new kitchen and eating well….I’m going for salad every day this summer, so I am happy to find this beet salad–can’t wait to try it. I’ll have to check on my beets and see if they are ready cuz this salad is getting made when they’re ready. I even have the pomegranate molasses and all the seeds. I just bought a mandoline and was wondering if you use one or just knife it. For years I refused to buy a mandoline, but the last year I was spending a long, long time finely slicing cabbage and other ingredients. It’s still in the box and now I’m second-guessing? I made this salad yesterday and it was SO good. I have no idea where you find pomegranate molasses in VA since I went to 4 very specialized stores and they did not have it. At the end i mixed regular molasses with pomegranate juice (did not have jam either, darn south). The salad was amazing though. This looks fantastical! I will most def be making this soon. I came across this on Knapkins. nice to meet you.